Graham Zusi played at one World Cup as an attacking midfielder. He might play his way to a second as a right back. The urge to label, designate or typecast players has deep roots. The first jersey numbering systems, which started to take shape in the late 1920s, were anchored by position rather than the person. The goalkeeper wore No. 1, and the numbers rose as you moved toward midfield. Much of that classification still exists. When we refer to 'a No. 1', any soccer watcher knows we’re talking about a first-choice goalie—even if that’s not the number on his back. Say ‘No. 10’ or ‘No. 6’, and we envision almost precisely the sort of midfielder being referenced. That's because positions matter. Even though coaches often say the modern game has become too dynamic and athletic for formation designations, we still often rely on them. It’s as if we have a better handle on a match after deciding that a given team is playing a 4-4-2 or 3-5-2, even though some of those 5s will become 3s while others join or support the 2s, who are probably very different players. Labels help us appreciate the responsibilities, roles and expectations assigned to given players. And they even help us understand the athletes themselves. A striker is a certain type of person. His or her sense of self and place in the team is shaped by the position’s demands and rewards. Restlessness, opportunism and a thirst for glory describe top strikers in turn. No. 10s are creators. No. 6s are destroyers. Playing those roles is as much about the talent in your feet as what’s in your heart, lungs and head. That instinct and outlook help define the position, and so the position helps define you. But a modern soccer player is defined by so much more. And Graham Zusi, who wears a box-to-box midfielder’s No. 8 for club and an inactive player’s No. 19 for country, is a modern soccer player. Vermes was a starting forward at the 1990 World Cup, and a decade later, he was the MLS Defender of the Year. He understands what modern players must bring to the field. And in Zusi, he’s got a protege who’s played a massive role in helping SKC win trophies, who is a likely starter in Friday’s pivotal qualifier between the USA and Costa Rica and who, if form holds, has an excellent chance to make one World Cup team as an attacking midfielder and then a second as a right back. Zusi, naturally, isn’t doing it for credit. He’s doing it to remain a contributor and stay on the field, because that, rather than a particular spot on it, is how he defines himself. The 31-year-old sat down with Vermes following the 2016 season to discuss a permanent move to right back (after a couple trial runs that season), but it never occurred to him that he was being asked to abandon his footballing identity or turn his back on his ambition. Zusi made his mark in midfield, first centrally and then out wide for both SKC and the USA. He had good technique and vision and could hit the sort of pass—either in transition or off a set piece—that pried opponents apart. And his athleticism remains underrated. From 2011 through 2014, Zusi tallied 21 goals and 44 assists for SKC and was an international regular under Jurgen Klinsmann. He was a consistent performer with a consistent means of contributing. And now he was being asked to be something else. That May match ended 1-1, but SKC outshot the Galaxy 17-4 and held more than 66% of possession. Sporting forgot its finishing boots that day but a point was earned and made—teams that want to keep the ball should have players at every position who are good with it. “In a game, usually the outside backs have the most touches on the ball. You have to have a good passer of the ball,” Arena said. Moving toward modernity requires flexibility. Things change, and you adapt or die. Tactics have been overhauled again and again, lineups and managers come and go and players get fitter and more flexible. Vermes’s search for those qualities in his charges has helped transform SKC. This was a club that won U.S. Open Cup and MLS Cup titles in 2012 and ’13 with vigorous pressure, quick transition and fast, athletic forwards. Now it’s a more patient team that, as of mid-August, possessed the ball more than every club in MLS but one (Atlanta United). 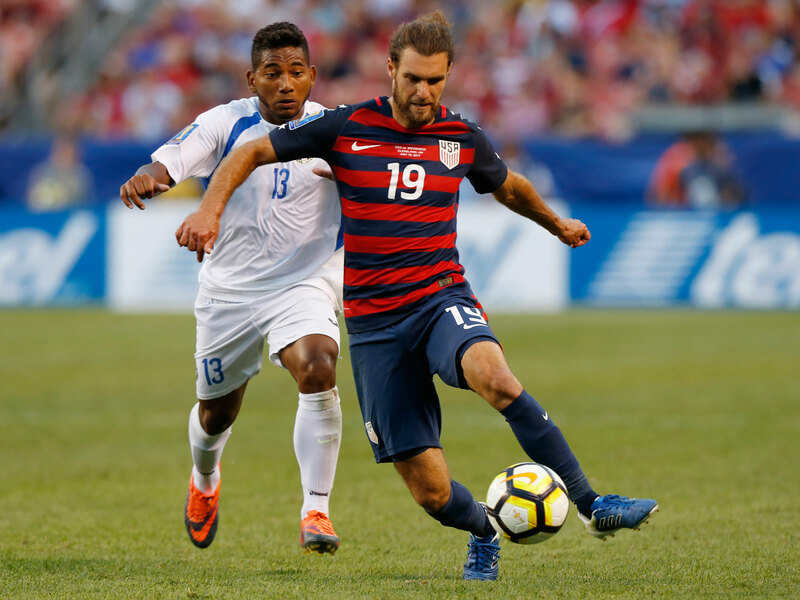 The arrival of the likes of Gerso Fernandes and Latif Blessing gave Vermes options, and allowed him the luxury—if Zusi was willing—to field an outside back with playmaker’s skill. There’d be a learning curve, of course. Zusi’s attacking instincts may not define him, but they still had primacy. But a good soccer player is a good soccer player. Rather than feeling that he was forced to abandon what he was good at, Zusi saw a chance to bring what he did well to a new position. That would help SKC with its evolution and, as he said, help him stay relevant on a national team that was adding Christian Pulisic, Darlington Nagbe, Paul Arriola and more. “I’ve always been a player that Peter’s been able to plug me in wherever he needs me and I’ve never held a grudge against it. I’ve never told him, ‘but Peter, I’m a central midfielder,’” he said. “The way we play now, he wants and needs someone at every single position who wants the ball, can handle the ball, and I think that was a big part of it. He said he likes the fact that he’s usually facing the field when he receives the ball, giving him more time to assess his options and pick out the proper pass. In a sense, on a team that wants to keep the ball and/or build out of the back, his work is similar to what it was in midfield. The starting point simply is deeper. The harder part, not surprisingly, has been protecting and keeping track of the space behind him. He recalled a long, diagonal ball during the March qualifier in Panama that served as one such lesson. Zusi saw the pass coming and his first thought was to win the ball, as he would have playing higher up the field in a system that valued turnovers and transition. But the pass carried over his head, and the space behind him was exposed. The Panamanian player who ran onto the pass was able to get off a shot. Someone like DeAndre Yedlin, who stands atop the national team’s right back depth chart, might have the speed to recover and confront the attacker. Yedlin is a different player than Zusi, obviously. The Newcastle United fullback is faster over long distances and more likely to dribble at an opponent or carry the ball toward the corner before looking for a cross. Similar qualities aided DaMarcus Beasley in his transition from winger to outside back. And Yedlin has more defensive experience than Zusi despite being seven years younger. But he’s not as strong in possession and he’s not as durable. Yedlin has just three caps this year compared to Zusi’s team-leading 11, and he’s out for the upcoming two qualifiers with a hurt hamstring. Zusi probably wouldn't be starting if Yedlin were available. But Zusi has a good chance to start Friday at Red Bull Arena because of the transition he’s been able to make. “You have to be a soccer player to make that transition. You also have to already have qualities that can allow you to take on the role and responsibilities that go with that position. And he does,” Vermes said. “The only way that you can make a that drastic of a change in your career—the only way you can do it positively—is if you have a good attitude. That’s what it really comes down to. If you don’t have that, you’re not going to be able to deal with it. It certainly gives Arena valuable options and cover at an important spot on the field, and it helps a national team that also is evolving into a more skillful, proactive side. From the four forwards to Pulisic and Nagbe, there’s arguably unprecedented attacking depth on Arena’s current team. As the USA evolves and as the game evolves, Zusi has committed to keeping pace.